Thumbs Up! specialise in unusual tech as well as some more special items. 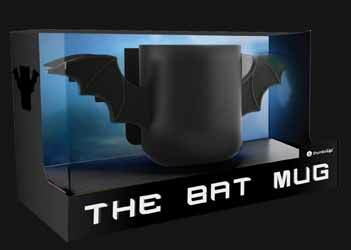 The Bat Mug is another in their range of amusing ceramics. 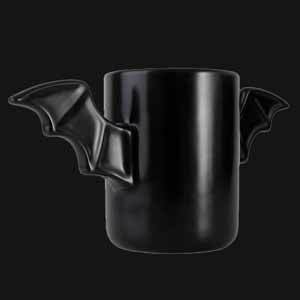 I’m guessing that the mug is trying to cover both Batman fans, without actually stepping on anyone’s copyright as well as Halloween. It’s a sturdy mug, fully microwave safe with a silk black finish. The wings add a lot of weight and having both wings makes the mug more reasonable as a soup mug rather than coffee. With the mug's shape, storage is probably going to be an issue, with no holes in the wings it’s not going to fit on your mug tree and the overall shape means that the mug cannot be stacked. That said it’s a fun item, sturdily made.